This is the second year we've hosted Christmas in July and it feels familiarly odd to be working on holiday decorations when it is sunny and warm out. 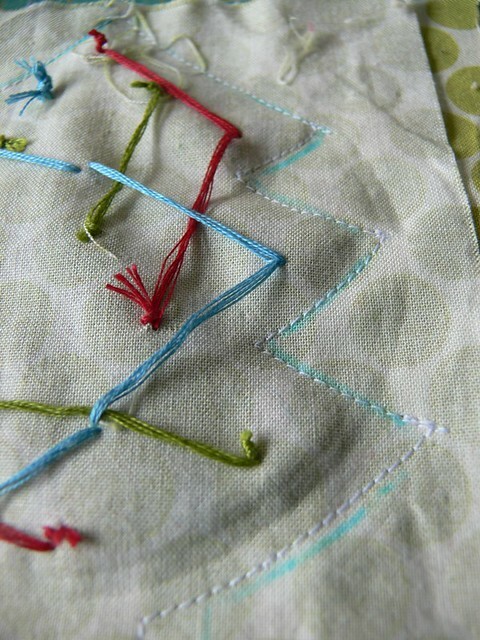 We spend most days at the beach or the park, then in the evening I embroider little Christmas trees... weird! 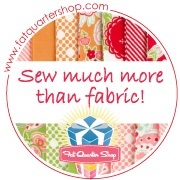 But I know I'll be so glad to have some fresh handmade goodness with which to decorate at Christmas time! I finished some ornaments yesterday, with a design I had been mulling over for a while. 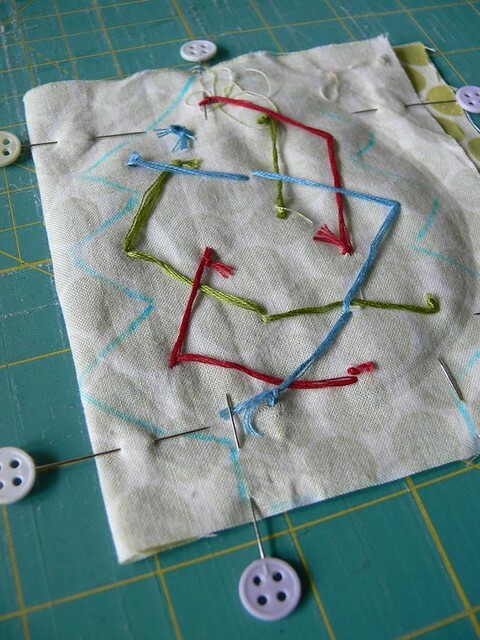 And I thought I'd share a little tutorial so you can make some too! I hope you like them! You'll want to start by printing out my template (PDF) for the tree. I recommend printing or tracing onto cardstock. 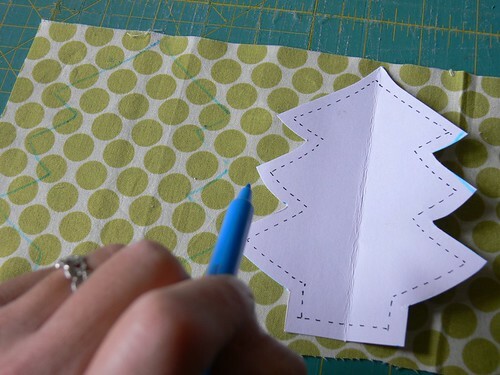 Then cut out the tree shape. This tutorial is for your personal use and enjoyment only. Please do not sell or copy this pattern, or use it for profit. Thank you for respecting my copyright! 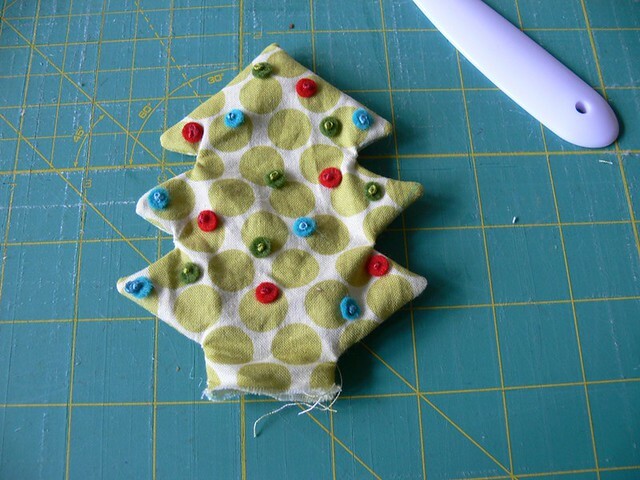 If you make an ornament or a few with this tutorial, I'd love to see them! Please upload photos to our Flickr friends group! 1. 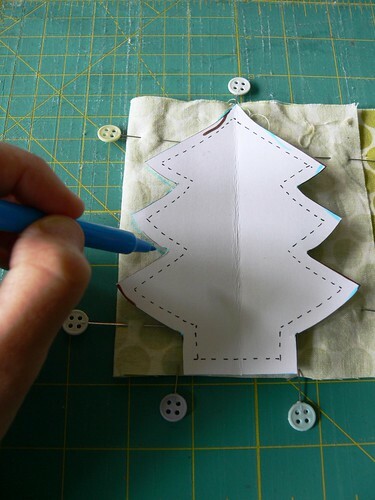 With your fabric right side up, position your tree template at one end of the fabric rectangle (leaving at least 1/4 inch seam allowance from the edge) and trace the shape with a fabric marker. 2. 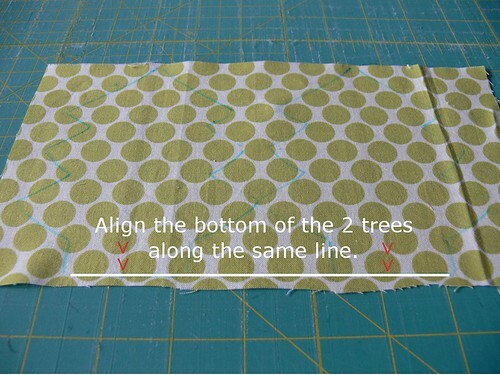 Aligning the bottom edge of the second tree with the first tree's bottom edge, trace a second tree at the other end of your fabric rectangle (again making sure to leave a 1/4 inch seam allowance from the edge). 3. 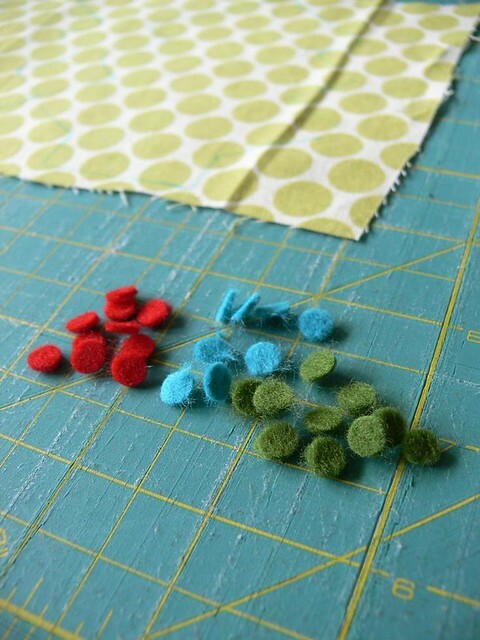 Grab your felt and hole puncher and start making some felt confetti! 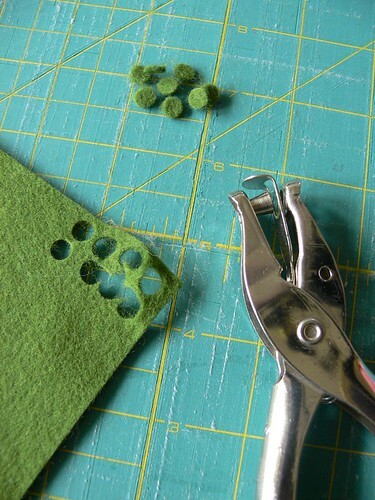 You'll want about 15-20 dots per side, so 30-40 felt dots in total. 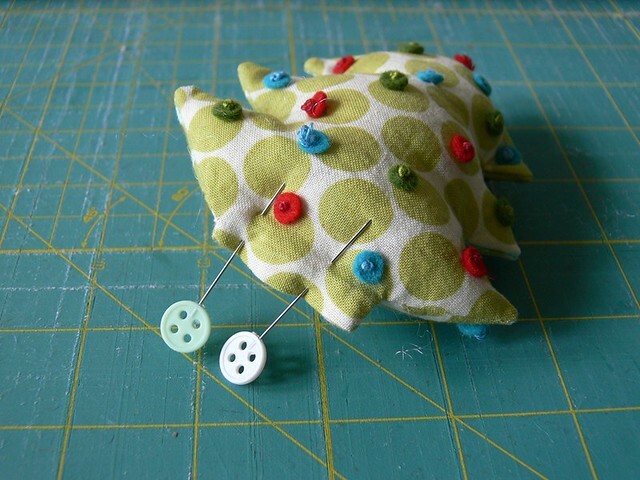 You can make them all out of the same felt or a combination of colors. 4. 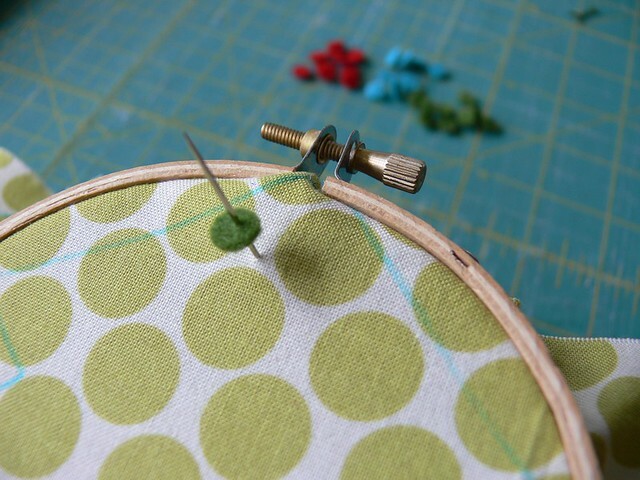 Stretch your fabric into the embroidery hoop, centering one tree within the hoop. 5. 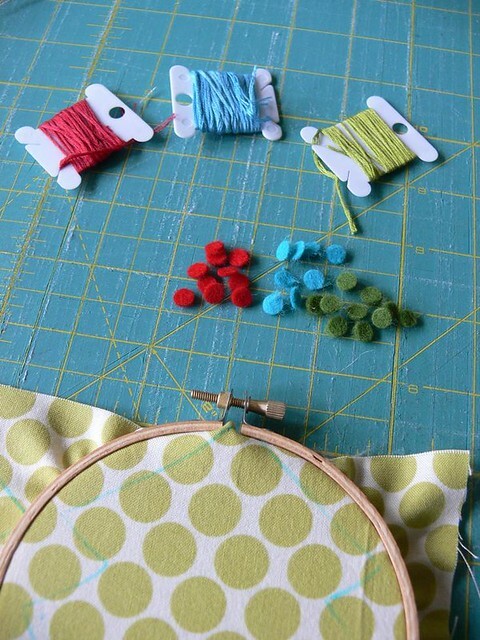 Gather your coordinating embroidery floss and choose one color with which to begin. 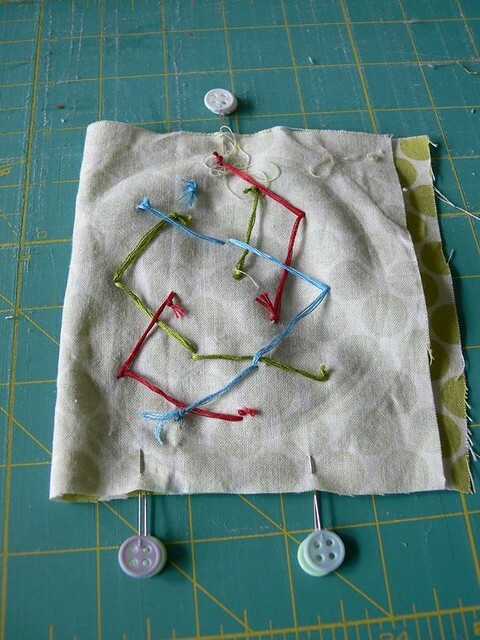 Thread your needle with an arm's length of floss. 6. 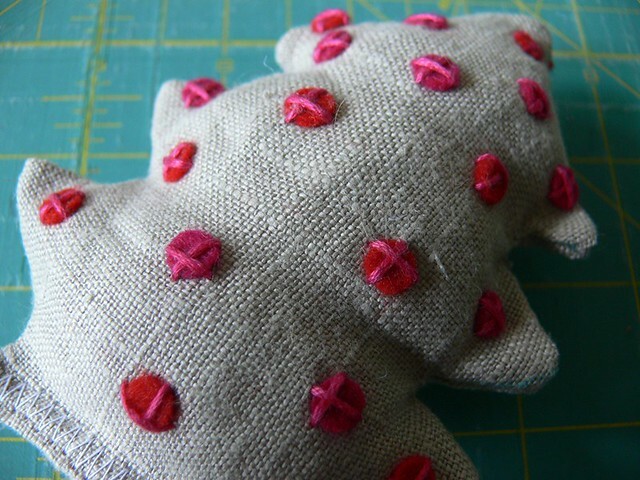 This is where we begin adding felt dots and French Knots (aka ornaments!) to our tree. 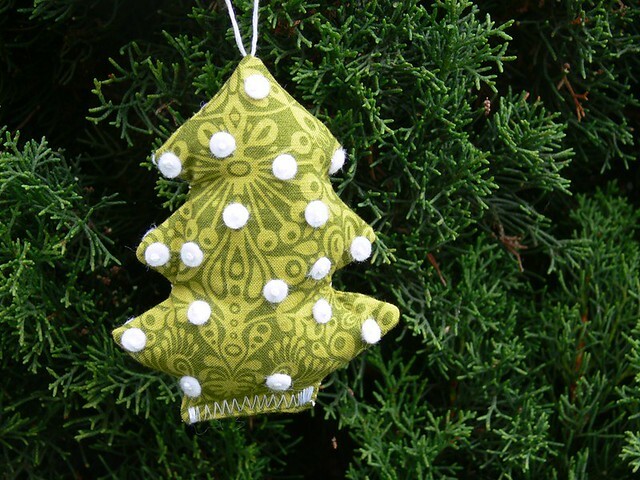 You'll want to make sure and leave at least 1/4 inch of free space all around your tree shape. This boundary is indicated with the dotted line on the template. 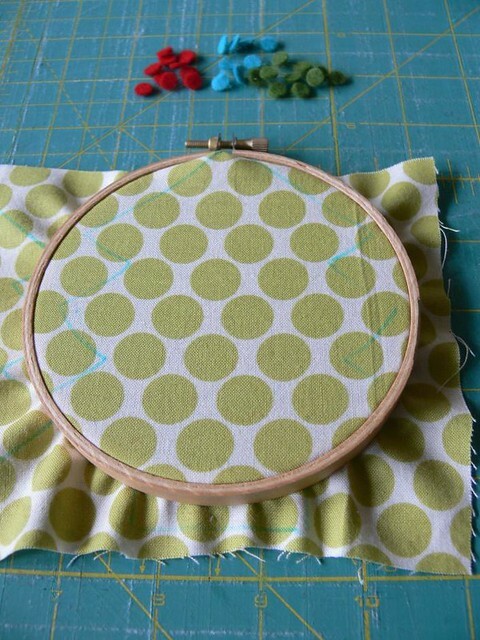 In other words, all your felt dots and French Knots should fit within that dotted outline. 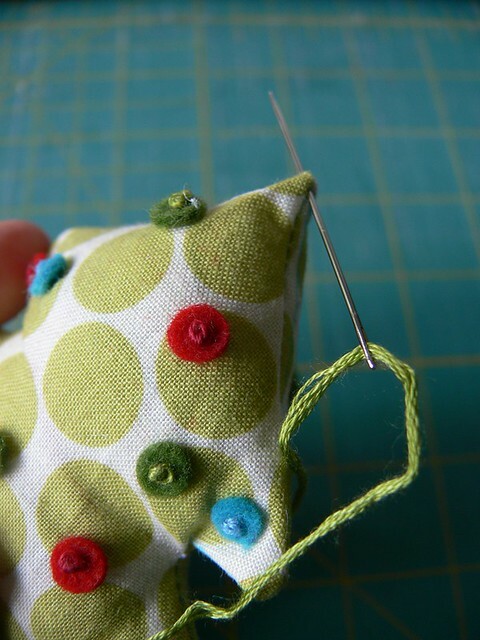 Sticking your needle through the fabric from underneath, poke a felt dot of the corresponding color and pull your needle and floss through. 7. 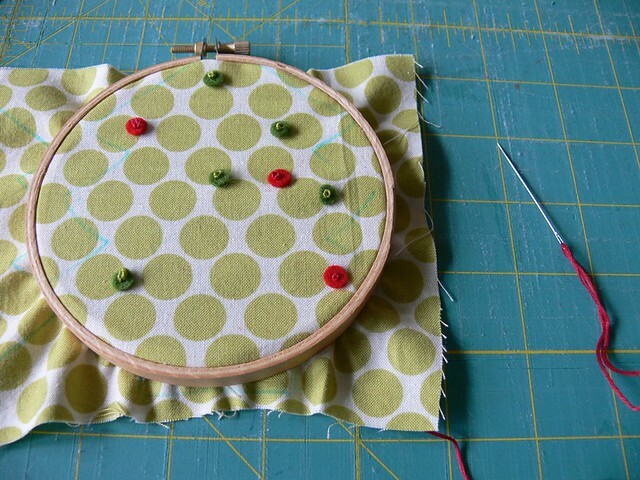 Make a French Knot: Wrap the floss twice around the needle and pull it taut as you poke the needle back straight through the center of the felt dot. 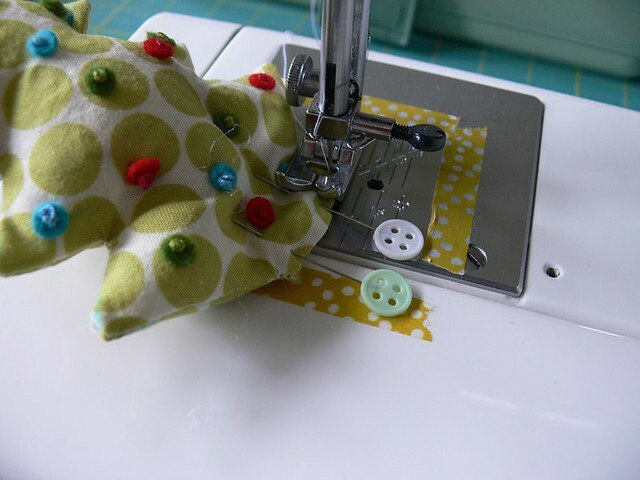 Don't let go of the taut floss until you've pulled the needle and thread all the way out and you have a nice, tight little knot on top of your felt dot. 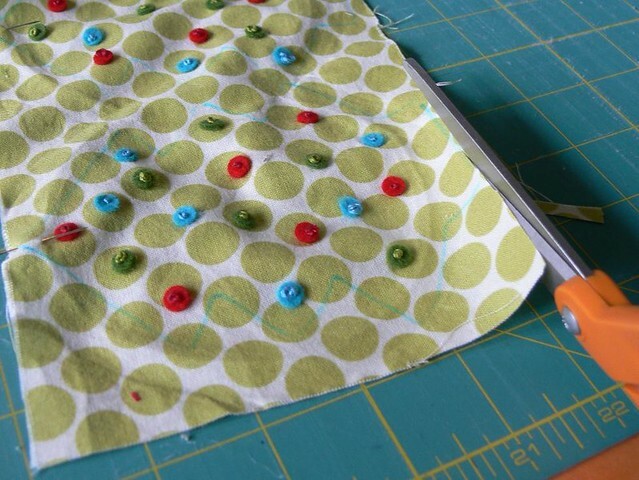 Repeat this step multiple times with various dots and various colors. 8. 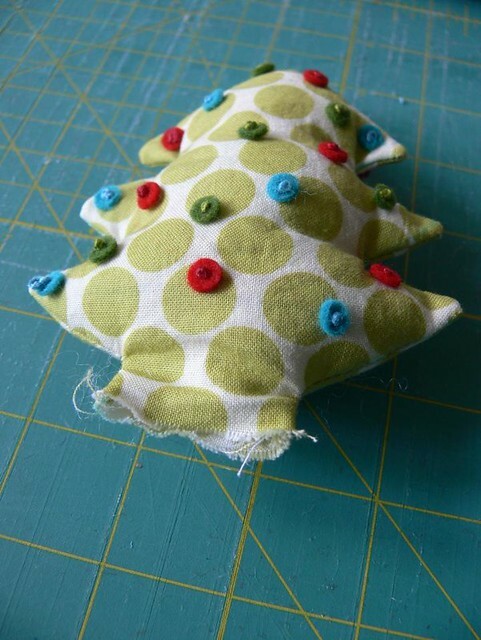 Keep adding felt dots and French knots, then move on to the second tree shape. 9. 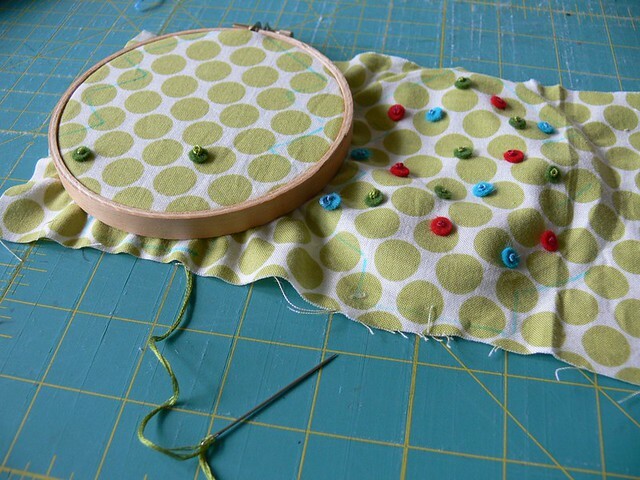 When you're satisfied with the amount of decoration on the two sides of your tree, remove the fabric from the hoop. 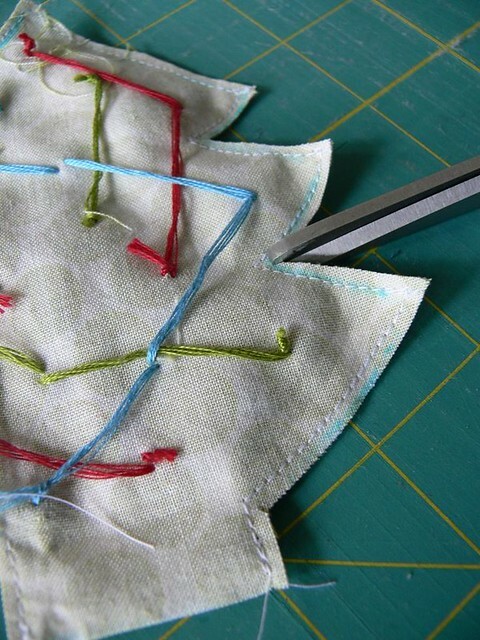 Using sharp scissors, trim the fabric along the bottom edge of the two trees. 10. 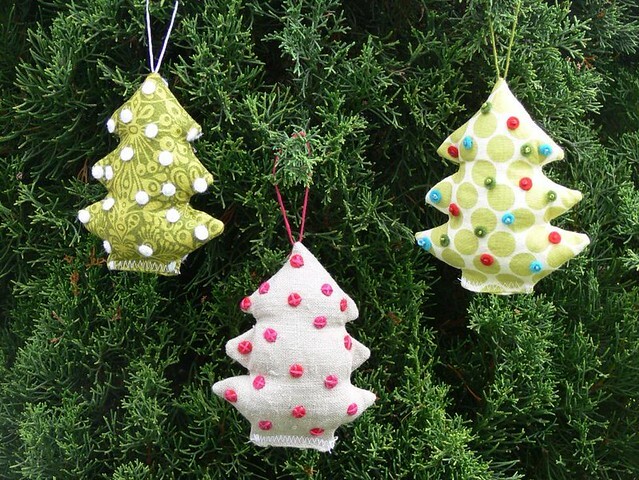 Using pins, mark the pointed top of each tree, and the edges of the trunk for each tree. That is 3 markers for each tree. 11. 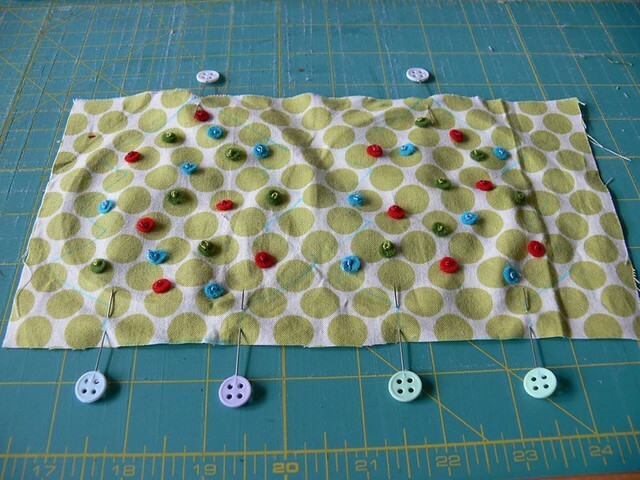 Fold your fabric in half and align the 3 pins/markers on each tree. Pin all around to secure. Make sure to keep the pins in each of the 3 marker spots. 12. 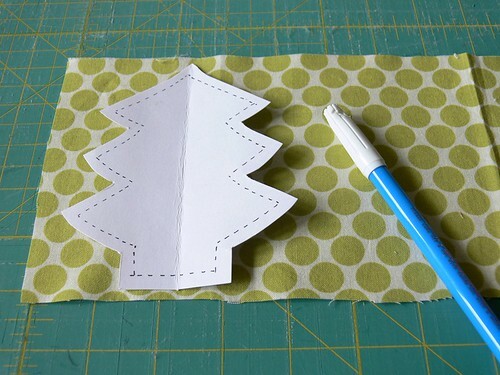 Grab your tree template and your fabric marker one more time. Align it with the 3 marker pins. Draw the outline in marker, on the wrong side of the fabric this time. 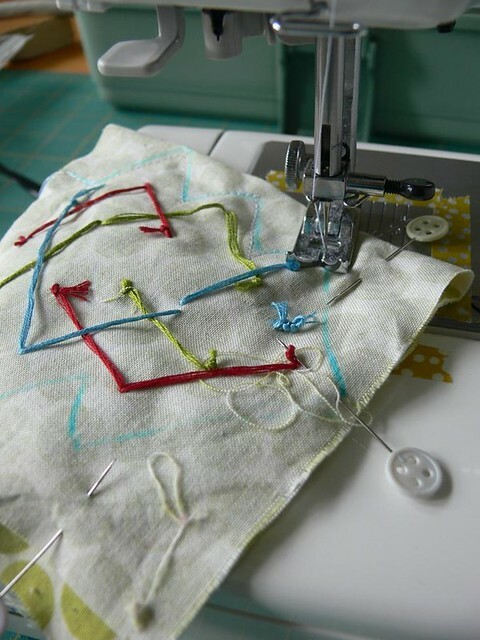 This is your stitch line. 13. 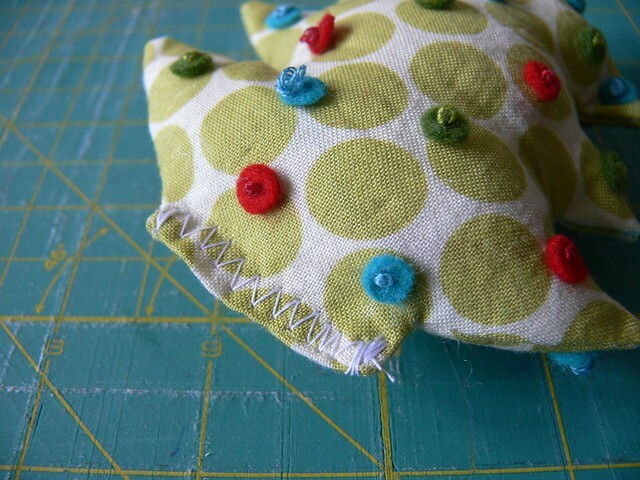 Carefully stitch all along the outline you just marked, removing pins as you go. Leave the bottom edge of the tree open. 14. 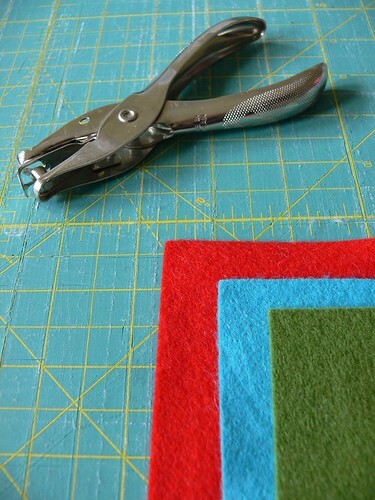 Grab your sharp scissors again, and trim the seam allowances very carefully, as close to the stitches as possible (roughly 1/8 inch). Clip the sharp angles between the "branches". 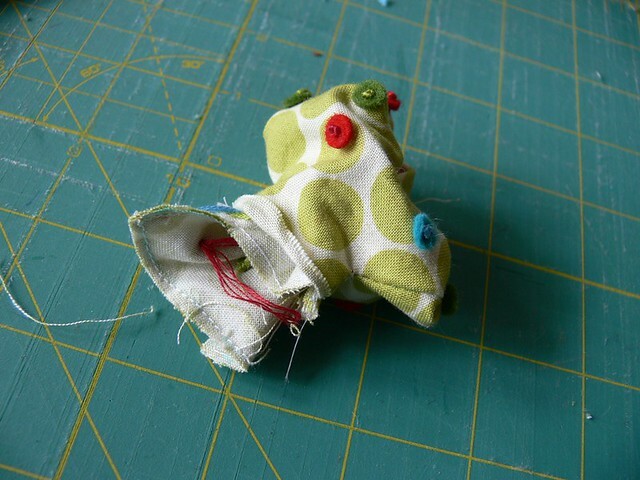 Careful not to cut into your stitches! 15. 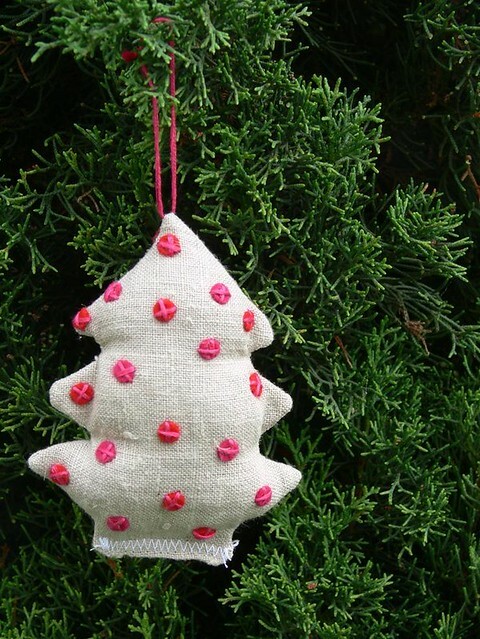 Time to turn your tree inside out. Very gently, now. So grab your point turner or a chopstick and gently poke those "branches" out. 17. 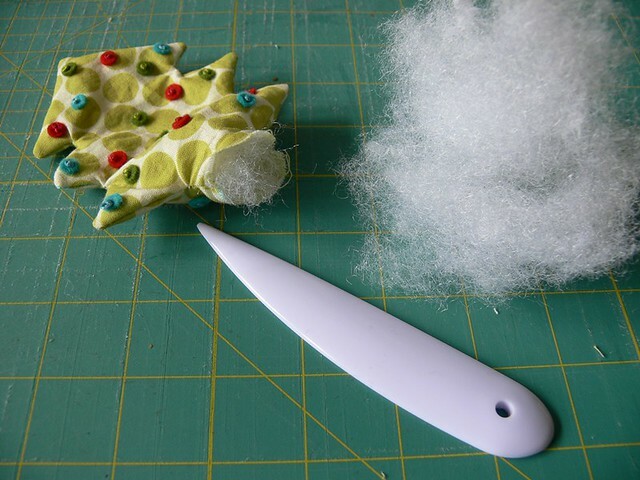 Stuff your tree with about a handful of polyfill, using your point turner or chopstick to push a little polyfill into the "branches". 18. 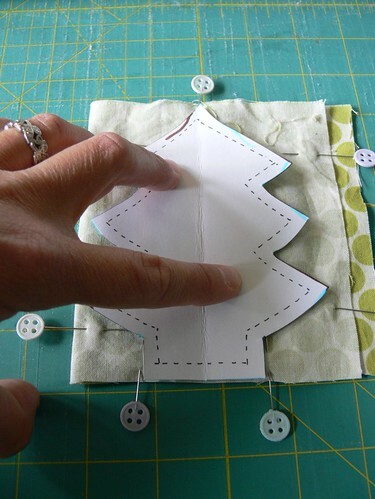 Fold the bottom edge of the tree 1/4 inch in all around, and secure with pins. 19. 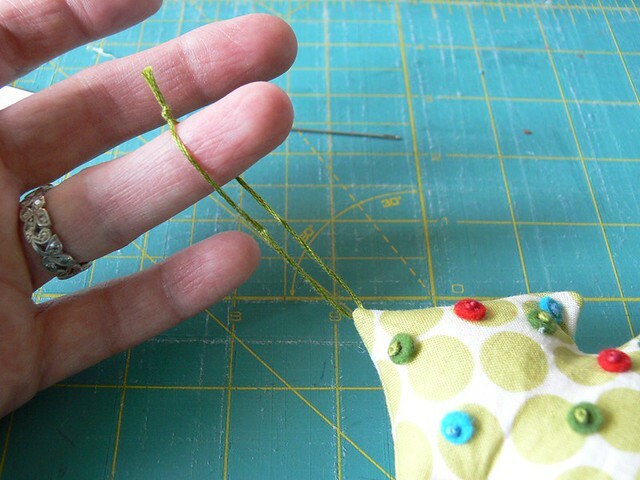 Zigzag stitch the opening closed, removing pins as you go. 20. Thread your embroidery needle with about 8-10 inches of embroidery floss. 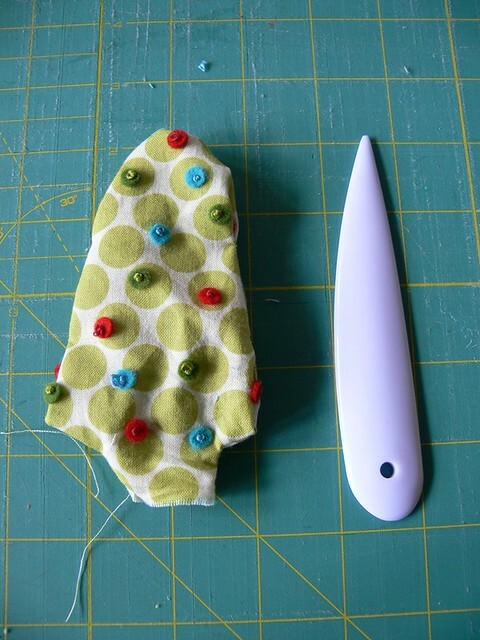 Pinch the top of your tree and poke the needle through, about 1/8 inch from the very top. 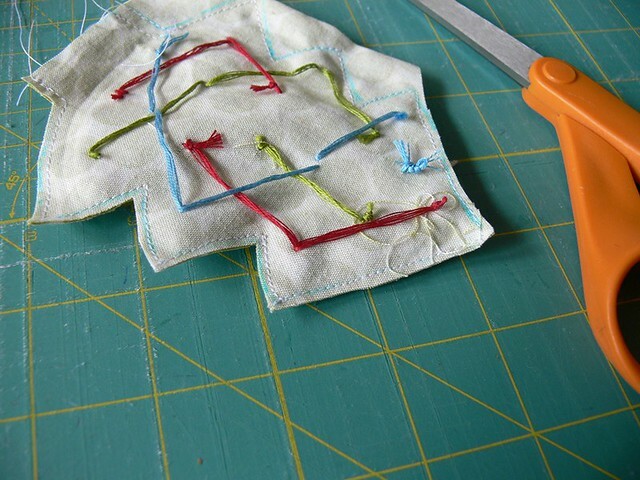 Pull your floss through, then tie a knot and trim the excess floss. 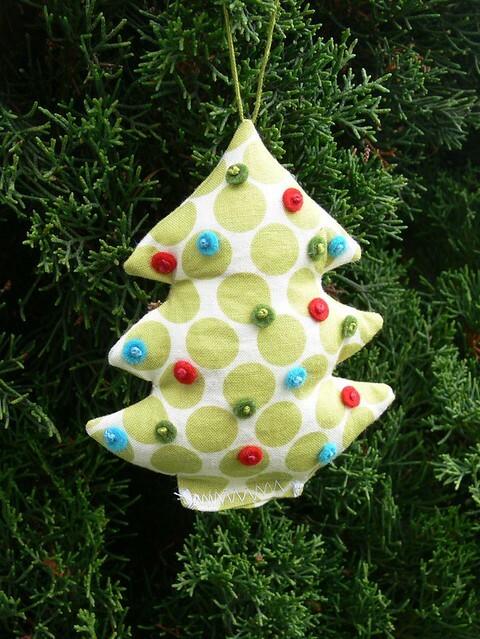 For a variation on this tree, you can affix the felt dots with an embroidered X instead of a French knot. I kind of like how this linen tree turned out! Here's another tree I made, trying out the single color embellishment. This one may be my favorite! 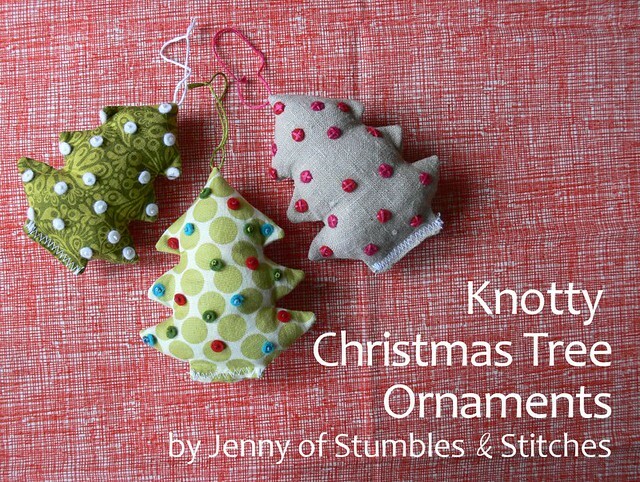 I hope you enjoyed this tutorial and that you'll try out some Knotty Christmas Tree Ornaments for this holiday season! Please let me know if you have any questions or feedback, I'd love to hear. Come back through this week and next for more Christmas in July fun, starting with a felt-y giveaway tomorrow!! Anyway, love these little ornaments and appreciate the head start on Christmas. Thanks! Thank you both for the kind comments. I would love to see them if you make some! Thank you so much for sharing. They are quite cute. I started making mug rugs for Christmas presents in July...it's never to early to start! These will be fun to make! Such a great idea. 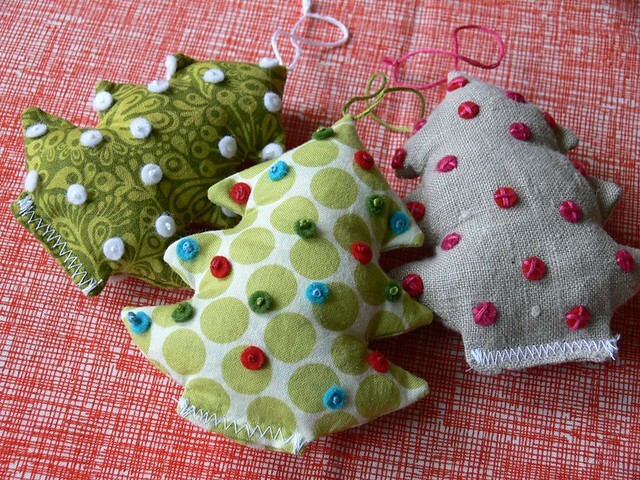 It is lovely and so cute Christmas Ornaments. I really liked it. Thank you so much for the precious and creative post. Awww, that is sooo beautiful! So pretty! i love that Christmas ornament,! 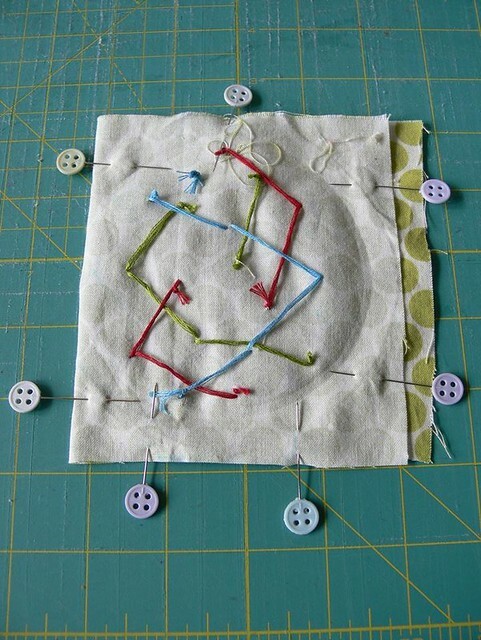 Thanks for sharing your ideas and tutorial, I'd want to try this together with my nieces on christmas. Happy holidays and have fun crafting! these are very fun and creative - thanks so much for the tute! 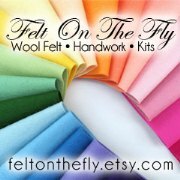 Christmas in July: Giveaway from Felt On The Fly! WIP: Milk and Cookie mat! Read Between the Lines Pillow: Free Download! Christmas in July: For the Weekend! Guest Post for Shorts on the Line! 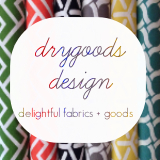 Christmas in July: Alewives Fabric Giveaway! Milk and Cookie Mats: Free Download! Christmas in July 2012: Get ready! Mod Podge Rocks! Giveaway: 12 more hours!